Being a leader in today’s burgeoning business world is a tough job. However, women have taken giant leaps forward and secured for themselves the coveted corner office, in recent times. That makes due recognition of one’s innate leadership skills even sweeter than it is deemed to be. 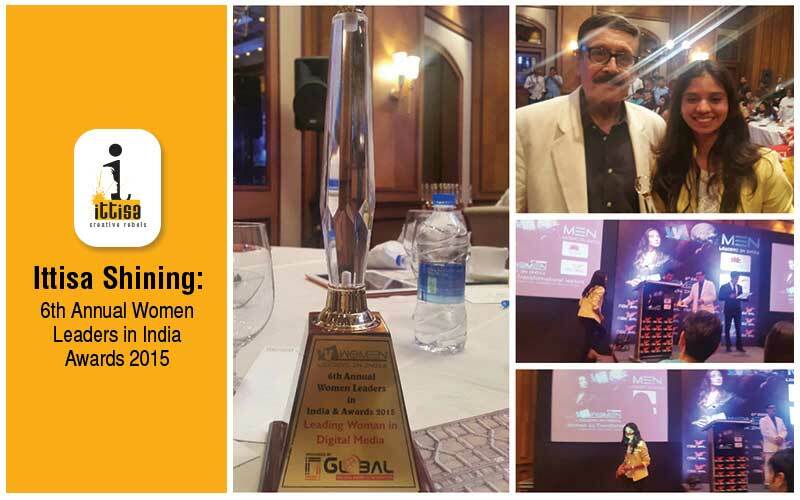 This week, Ittisa was all smiles as our founder Sneh Sharma ascended the steps to the dais to collect her award for ‘Leading Woman in Digital Media’. Held at the prestigious Taj Lands Hotel in Mumbai, her efforts were lauded by a crowd that largely consisted of many an inspiring woman who has contributed a great deal to her field. To collect the award in the presence of such an inspiring crowd was indeed humbling. Empowering women is something that we at Ittisa have always stood for. The motivation to compete and work hard in the face of scepticism is what sets us apart, and it is also that which has helped bring awards and recognition our way. No other words can surmise better, the things we do at Ittisa. Kodus to every woman out there who have joined hands with their fellow women to take that step forward in leading from the front! Today is not around the abilities, qualifications or proportionate representation of women at entry or mid-level positions in the workplace. It is around retaining as many of the high potential and emerging women leaders in the workforce as they end up either changing careers or dropping out of the workforce due to an increase in maternal and familial obligations.